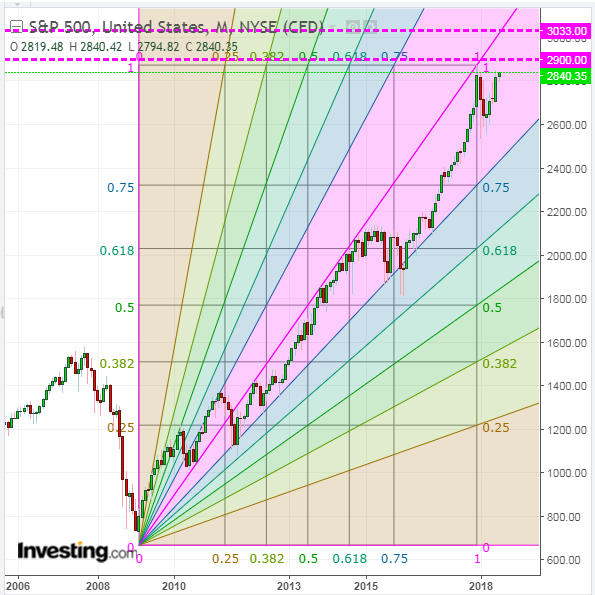 Overlayed on each of the following two monthly charts of the S&P 500 Index (SPX) is a Fibonacci Speed Resistance Fan. 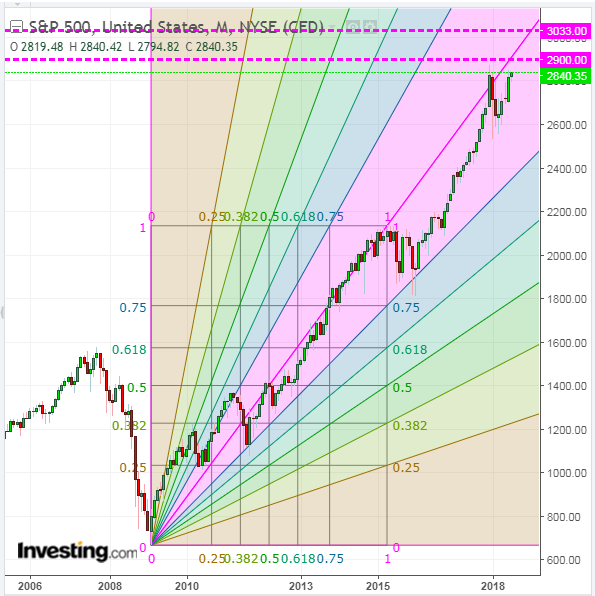 The first one is taken from the low of March 2009 to the high of May 2015, which preceded the last major pullback to first fanline support and prior to the recent minor one this past February. Based on this fan trajectory, the first major resistance level sits just above the last all-time high (of 2872.87) at 2900. The second one is taken from the low of March 2009 to the high of January 2018, which was when the last record high was made. Based on this fan trajectory, the second major resistance level sits at 3033. It's been quite a while since we saw a pullback to first fanline support (a year and a half), and this nine-year (predominantly) bull run is running the risk of a much larger pullback, the longer it keeps breaking record highs. And, we're approaching the U.S. midterm elections, which are only three months away, as well as getting closer to more rate hikes by the Fed as they still have three chances this year to do so. Add to that mix the potential for a trade war escalation, and there are building headwinds for Q3 and Q4. 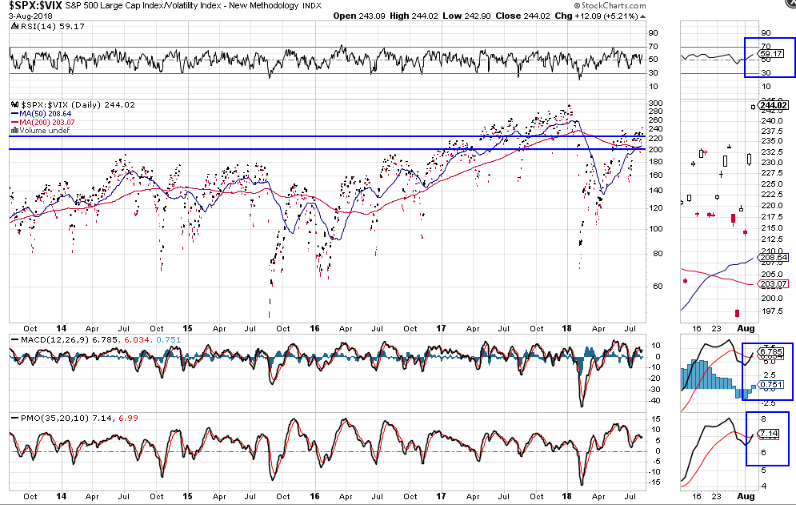 The momentum (MOM) and rate-of-change (ROC) indicators have been waning since January of this year, as shown on the next monthly chart. In fact, the ROC is hovering just above the zero level. Both MOM and ROC made a new swing high as price set its record high in January. If we see a push higher to 2900, or even 3033, keep an eye on MOM and ROC to see whether they make a higher swing high than January's. If so, we may see price eventually push higher. Otherwise, we may finally see that larger pullback occur. Finally, I last wrote about the SPX:VIX ratio in my post of July 10. Price has recently popped above what is now minor support of 225 and major support of 200, as shown on the following daily ratio chart of SPX:VIX. The 50 and 200 MAs have formed a bullish Golden Cross, and all three technical indicators have made new "BUY" signals, but are still in downtrend. 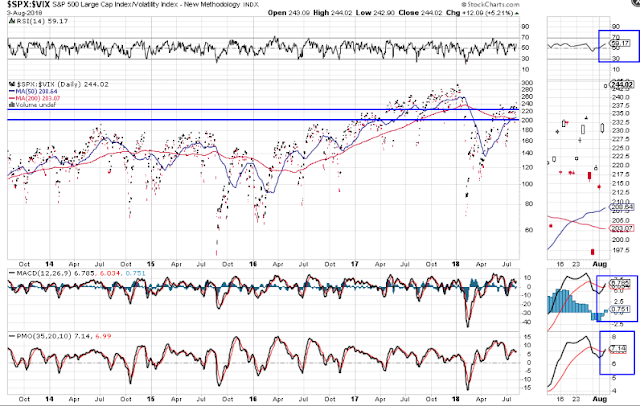 If the SPX reaches 2900 or 3033, I'd like to see price, RSI, MACD and PMO on this ratio make a new record high (in addition to new swing highs on the above-mentioned MOM and ROC indicators), to confirm the possibility of a bullish bias being sustained. 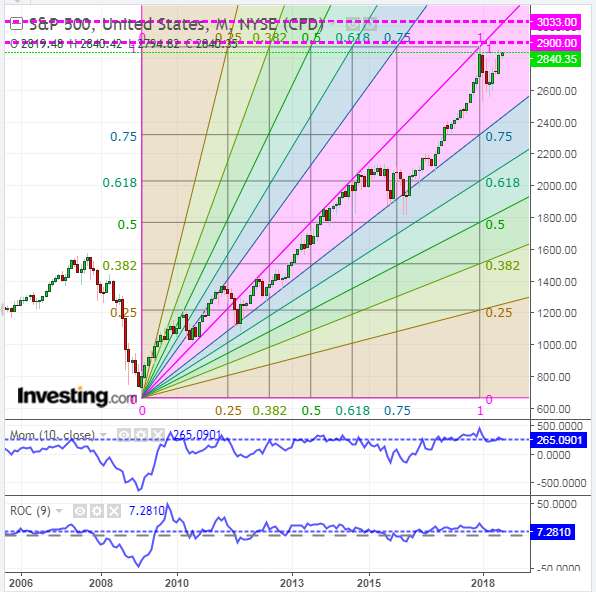 Otherwise, that larger pullback may occur on the SPX.